Calmex Canine Anxiety and Stress Relief Capsules is a product that utilises a combination of two amino acids, a plant extract and numerous B vitamins to help calm anxious or stressed dogs. This fast acting mix of ingredients produces a synergistic effect that modulates neurone transmission within the brain. 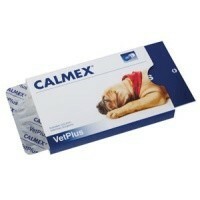 As a result, Calmex provides acute anxiolysis and mild sedation, giving that much needed relief to your pet. This highly useful treatment is great for dogs who suffer from noise phobia, separation anxiety and situational phobias. Best used in conjunction with behavioural programmes, but can also be used on its own. For use with veterinary guidance only.